This Link of the Week 2009 page is dedicated to cool origami links. The links can lead to web sites, youtube videos, news articles, or sightings where very interesting paper works are seen. November 2009: Week 3: Check out these cute origami dinosaurs. They were used by People Gas (natural gas delivery company) to show that paper bills were things of the past: go for e-billing instead. These dinosaurs were called Paperbillasaurus, Envelapatops, and Stampadactyl (Checkosaurus rex not shown). See more here. Week 2: If you are not familiar with the work of Joseph Wu, then feast your eyes on this origami dragon. 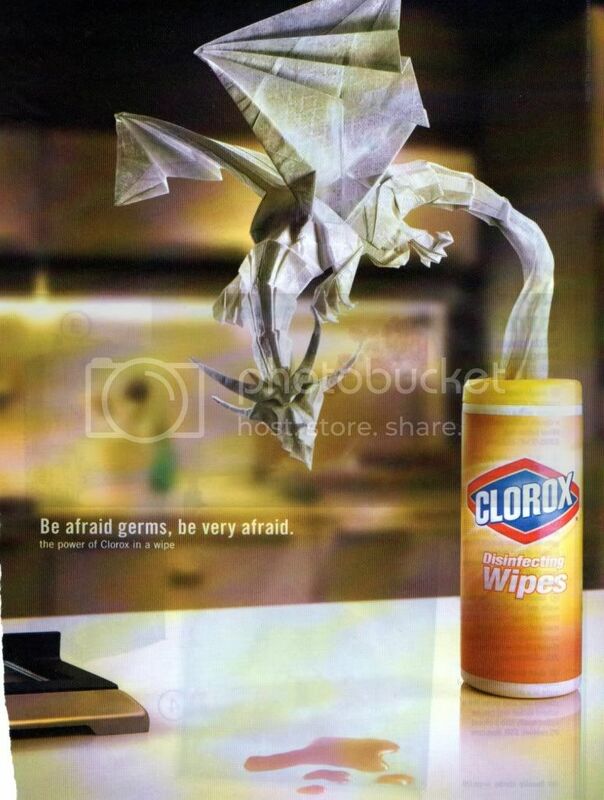 It was made for Clorox (antibacterial wipes) and the title says: Be afraid germs, be very afraid". See enlargement here; original posting here; or try your hand at folding origami dragons here. Week 1: Does this look like a regular McChicken sandwich from McDonalds? Well, look again, look very closely and you will see that the wrapper has an image of an origami chicken. Although this McChicken sandwich is only $1, it's got an element of art hidden in it - you might even call it classy... or maybe that's going too far. See original posting from GrubGrade, or get instructions to fold this origami chicken here. October 2009: Week 4: This article has been around since 2004, but it took me this long to discover it. In the 2004 Fashion Week in Sau Paulo (Brazil), designer, Jum Nanao, spent 700 hours painstakingly cutting, curling, pleating and manipulating paper into stunning dresses. Click here to see the cage-like skirts, conical dresses, curled-paper collars, and lacy cut-outs to die for! Everything done in white paper and if that wasn't enough, at the end of the runway show, the models lined up side by side and ripped their paper-dresses off. Week 3: Sipho Mabona is making a spash, or should I say, he is the buzz on the net. Featured in Telegraph.co.uk, Sipho says that this female praying matis took 20 hours of solid folding to complete. If you think that's a long time, it takes him up to 6 months to design an origami model from scratch. If you want him to design something for you, it'll cost you about 300 to 2,500 Swiss francs, or 1,500 Britsh pounds. See more of his fabulous artwork on his Flickr site or his web site. I'm not much of an insect fan myself, but I do love his inflatable puffer fish (fugu) which Sipho has also chosen as his logo. Week 2: If you like tea and origami, then this link is the link for you! Imagine tea leaves contained in this origami-bird shaped tea-bag. It's nothing short of sublime. Designed by Nathalia Ponomareva of Russia, these are not commercially available yet. Enlarge photo. Week 1: The October 2009 issue of National Geographic has a 3 page spread on origami. The article talks about the unexpected uses of origami such as in the folding of space telescopes and in the design of stents. Thanks to Robert Lang, Erik Demaine, and other scientists, the ancient art of paper folding is fast becoming a modern art of science and math. See National Geographic article here. See more scientific uses of origami here. September 2009: Week 4: On a larger scale, Deb Pun Discoe organized the folding and assembly of a "1000 Peace Crane Banner". This colorful banner was paraded around the 3rd annual Peace Day Parade and Festival in Hawaii. The goal of the Peace Banner is to celebrate and promote peace, compassion, and awareness of global interdependence. Wow, that does sound like something we should repeat next year. Enlarge image here, or go to Deb's web site here. Enlarge Week 3: In honor of International Day of Peace (September 21, 2009), Keith Garner organizes origami cranes, swans, and flapping birds into the shape of an undulating flag of the United States of America. Such a beautiful display with approximately 1040 origami models: all folded by 5th graders! Go to Keith's blogspot for details. Go here to learn how to fold a paper crane or a flapping bird. Enlarge Week 2: Large size origami was featured in the "Climate Week Event" held in New York. OrigamiUSA volunteers, Robert Lang, and Linda Mihara did an outstanding job in creating over-sized origami models representing creatures from the rain forest. This origami installation called "Trees of Life + Hope in the Climate Debate" was free to the general public and included paper trees, leaves, birds, butterflies, frogs, and a lot of colorful flowers. See more photos by Andriy Portyanko. Week 1: It's never too early to fold origami calendars; 2010 is just 3 months away! Need a gift for an origami enthusiasts? Try folding them a 3D origami calendar, or buy them a Page-A-Day calendar so they can entertain themselves for the whole year. You can choose from origami, kirigami, or paper airplanes. See details here. August 2009: Week 4: Just outside of Tokyo, Kazuya Matsumoto (and 30+ volunteers) fold a giant origami dinosaur. The paper was 25 m2 (269 feet2) and costs about $800. The paper dinosaur was made for the Dinosaur Expo where various dinosaur fossils were on display. Organizer Matsumoto says that it is probably the world's largest paper dinosaur. See video of paper dinosaur being made here or see free origami dinosaur instructions here. Week 3: This amazing dress was made entirely out of newspaper by Isaac Mizrahi. This fashion designer rose to the challenge presented by USA Today to "Transform a stack of humble newspapers into an elegant garment". Well, you judge for yourself: newsworthy newsprint or what? Hear what he has to say here. Week 2: I always thought it was interesting that you can fold toilet paper origami-style. Now, even more interesting is toilet paper with instructions printed on it . You know what your house guests will be doing while in your bathroom. Week 1: Can you imagine a paper project which took 4 years to complete? Can you imagine that same project being burnt to the ground? That's exactly what Japanese origami artist, Wataru Ito, is planning to do. It took the art student 4 years to make the "Castle on the Ocean". It won't take that long for him to unmake the project with paper's nemesis: fire. July 2009: Week 4: Ou.... a classic example of boy meets girl using origami to express feelings from the heart. Butterflies, books and boys: what an irristible combination! This Paperoflexia (2009) video by Sinsellos should not be confused with the Papiroflexia video by J Baldwin. Both are must-see's. Week 3: Origami is seen more and more in everyday life. Here, the traditional origami crane is used to sell Paris Miki eyeware. How does the crane evoke feeling of clarity? Or is it the fact that you can make paper cranes in a variety of colors? Does it surprise you that the company was established in Japan? Do the cranes give you a fuzzy warm feeling consistent with Paris Miki's statement "...devoted to the company's ideology and is steadfast in offering customer care sincerely from the heart". Week 2: Speaking of useful origami, have you ever used origami to fold your laundry? Truly, this must be the best discovery ever! Convert a jumble of shirts into a neat stack in seconds! See how to do it here. Week 1: Homemakers and other household members often lament on the age-old problem of having too many plastic grocery bags. What do you do with a mess of bags? Origami comes to the rescue. You can fold the plastic bags origami style so they are space efficient, tidy, and you might even say that they're trendy. June 2009: Week 4:If you're not already there, you're probably too late. This last week in June is busy with the OrigamiUSA convention held in New York. Here, you'll meets lots of like-minded individuals and see some incredible paper art. Shown is Robert Lang's bowl. (from Michael Assis). Find another conference to attend. Week 2: Simon Schubert must be a very patient man, he creates incredible paper artwork by scoring lines on white paper. Some of these portraits take over a week to accomplish and has been rumored to sell for £3,800. You can see more of his pictures here or see his sculptural artwork here. Week 1: It's official: the Guinness World Record for the longest time a paper airplane was afloat has been broken! Takuo Toda holds the new world record: his paper craft flew for 27.9 seconds. The previous, 1998 World Record was held by Ken Blackburn and his plane was in flight for 27.6 seconds. How did Toda fold his paper aircraft? No one knows (yet), but you can watch the flight on this video. May 2009: Week 4: April showers bring May flowers, or so they say. If your hometown has not been blessed with warm weather and signs of spring, try creating your own spring by making origami flowers. This lovely floral wreath was created by Meenakshi Mukerji, and what a wreath! She and members of the Origami newsgroup compiled a list of all known origami roses online and in print. These can be found here. Week 3: The Cootie Catcher (also called a Fortune Teller or a Salt Cellar) is so ingrained into our cultures that it can straddle different crafts. Lynne Nicoletti uses aida cloth in the shape of a Cootie Cather for embroidery. 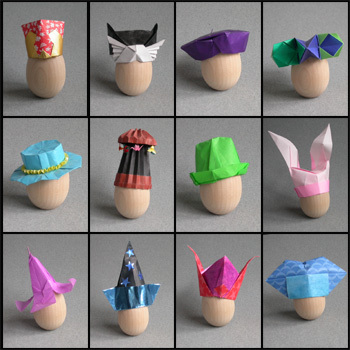 Not only do these look like Fortune Tellers, you can actually unfold them and get your fortune. Week 2: Have you ever wondered how to say "inside reverse fold" in German? How about "crimp" in Chinese? Now you can find out: Sara Adams' web site has a translation function which can translate your origami terms into 12 different languages. Genießen Sie! Week 1: Look at this modular origami spikey balls. Ha, fooled you! This model is actually made from cut-and-fold die-cut paper units. These take about 15 minutes to assemble whereas a true 30-piece, modular origami model of this size would take 5 to 6 hours to complete. There's 80 of them at the "Origami Festival" in the large Ayalon Mall in Ramat Gan, a suburb of Tel Aviv. April 2009: Week 4: By far, the most amazing thing that splashed into the origami world this week is the instructional video on how to fold Neil Elias' Last Waltz. Thanks to Sara Adams for a fabulous job in making the video and to Dave Venables for allowing the video to be made (copyright laws). Week 3: Robert Harbin was a magician and origami enthusiasts. He had his own television show; published numerous books on origami and magic; and was the first president of the British Origami Society. Shown here is a rare footage of his performance of Torn and Restored Newspaper. Classic magic trick: superbly executed. Week 2: This clip was uploaded onto YouTube this week. - and some stop-motion paper-art. Voila! Eden of the East - Futuristic Imagination" by safusu. Week 1: For those of you who love origami and rely on your computer to survive (if you are reading this page, it is likely that you're one of those people), then you may find these free icons interesting. They are origami icons which you can use to personalize your desktop. Thanks to Song Speckels, they're available for Windows and Mac. Click here for other origami related computer stuff. Week 4: As you make more and more origami, you will find that you lack space to display your creations. This causes people to fold smaller and smaller models as a way of being space efficient. In contrast, take a look at these 3 gentlemen who fold a 6 feet tall paper crane in less than 20 minutes. You need a basketball court to display one of these. Week 3: Some people drool over very complex origami whereas I'm more interested in things that the average person can do. In this manner, I really enjoy The Braid. It's a casual, easy-to-read blog by Leyla Torres. She does a great job in using origami to bring elegance and beauty into everyday lives. Week 2: Origami can be seen in many television shows (such as Num3ers) and Hollywood movies (such as Harry Potter & Blade Runner). But, I just love this spoof on the Matrix. Here, two martial art experts dual one another with a chain of paper dolls and a paper bird. Click here to see bigger image. Week 1: Did you know that you can buy paper that is made from poo? Innovative entrepreneurs make paper and paper products from the plant fibers extracted from animal poop. Cards, boxes, notebooks, picture frames... you name it, they probably make it. Click here for more poo-paper details. February 2009: Week 4: What better way to be noticed than origami business cards? Ilan Garibi creates his business cards one at a time: he cuts the paper to include extra paper on the top right side. He then painstakingly folds each card to produce a card with an embedded waterbomb base. Here's more examples of how to convert an ordinary business card into an extraordinary one. Week 3: Take a look at this cool modular origami piece (uses glue) which can transform itself from a stellated dodecahedron to a spikey flower. It's called "Revealed Flower" and was created by Valentian V Gonchar. First published in Russinan Origami, you can also see the instructions online. See transformation in photo or video format. Week 2: Speaking of cool origami which can transform itself, check out this piece of paper engineering by Haruki Nakamura. His paper sculptures rotate like gears and come together to form defined shapes. I can hardly believe that it is made of paper. See video here and here. Week 1: I've always been a fan of Joan Michaels Paque. She has a great sense of space and makes wonderful creations with paper, fabric and metal. Her paper arts uses complex pleat-and-twist folds, tessellations, and ideas from origami and pop up architecture. Week 3: In the last 5 years or so, people have been trying to create human figures with paper. Shown here is a life-like female torso made by http://www.flickr.com/photos/root2studio/">Mark Leonard. Not bad, don't you agree? Week 2: Remember the days when you used to cut paper snowflakes or a chain of paper dolls? Well, fast forward, no rocket forward to the new standard. Using nothing but an exacto knife and a stack of colored paper, Jen Stark can create some incredible paper sculptures. See an interview with this 24 year old, emerging artist here. Week 1: Check out this video called "In Pursuit of Perfection". The video is a tribute to ASICS, a small Japanese company developing sports goods. The reason it's listed here is because the video is an incredible 5 minutes of folded paper animation. The video won many awards but credit must be given to origami artists, Sipho Mabona. --> More cool origami stuff here. Many of these images are from the internet: they have gone viral without clear indication who is the rightful owner of the photo. Please let us know if you want your photo removed from this site.